La Princesse du pays de la porcelaine is signed and dated 'Whistler 1864', but work on it was probably started in 1863 and ended in 1865. 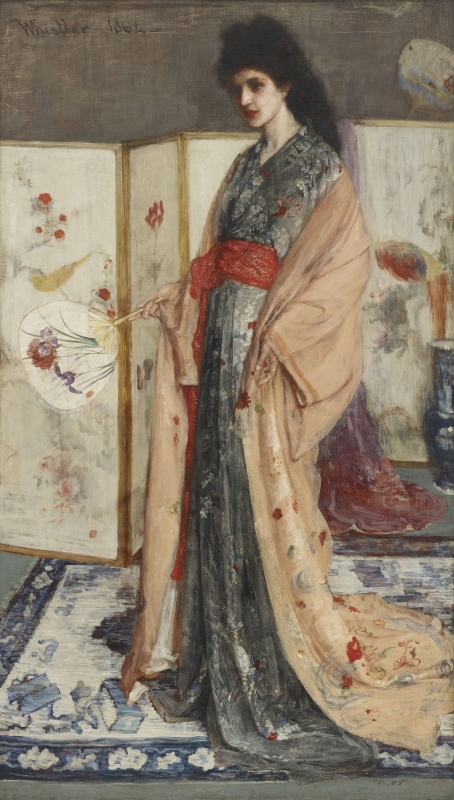 1865: Whistler told Fantin-Latour, 'la Japonaise me prend depuis le matin au Soir - Elle a été mise de coté jusquà present à cause de maladie du model - Ca va être bien je crois.' (Translation: 'the Japanese woman is taking me from morning to the evening - She was put aside until now because the model was unwell - I think she will be good.'). 5 Whistler worked on La Princesse du pays de la porcelaine in early March 1865, with the intention of sending it to the Salon. 6 It was first exhibited at the 83rd exhibition, Salon de 1865, Palais des Champs Elysées, Paris, 1865 (cat. no. 2220) as 'La Princesse du Pays de la Porcelaine'. 1: Pennell 1908 [more], vol. 1, pp. 122-25. 2: Whistler to Edwin Edwards, [9 August 1864], GUW #09083. 3: Du Maurier 1951 [more], p. 244. 5: [February/March 1865], GUW #08040. 6: Fantin-Latour to Edwin Edwards, 2 March 1865, copy in Bibliothèque Municipale, Grenoble. 7: New York Herald, 10 April 1876; see also Whistler's letter to F. R. Leyland, [April 1876], GW #02568.